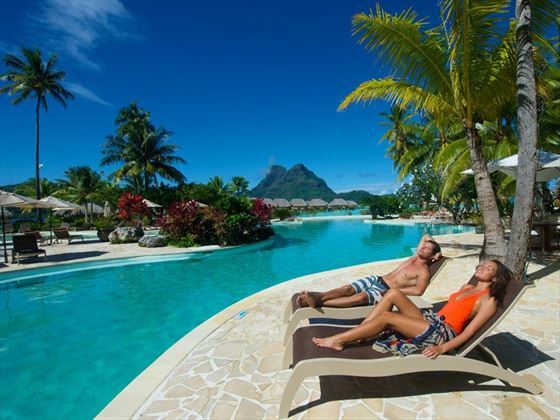 Located on Motu Tevairoa, a stunning coral islet situated between the azure ocean and crystalline lagoon, Bora Bora Pearl Beach is a blissful hideaway which boasts a sublime setting and views of the majestic Mount Otemanu. 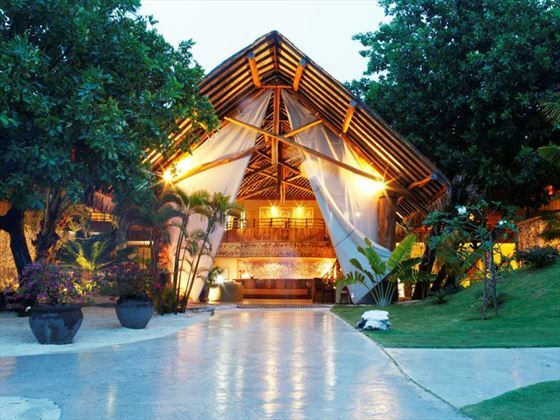 The resort is decorated with authentic Polynesian style throughout its accommodation, architecture, spa and restaurants, whilst ensuring the perfect blend of modernity. 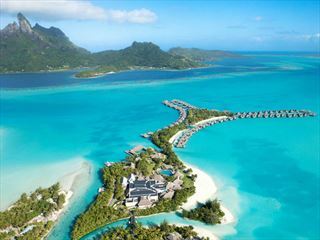 For the ultimate island experience, we think the overwater suites are a wonderful choice for couples, entailing a luxurious selection of amenities, direct access to the shimmering lagoon and ample living space, whilst the resort’s garden and beach accommodation is ideal for families with children. All eighty rooms, suites and villas are equipped with air-conditioning, stunning views, complimentary Wi-Fi and plush furnishings, whilst the upgraded villas and suites feature private gardens, Jacuzzis and plunge pools. There are three restaurants and one bar located around the resort property, each serving a vibrant fusion of international cuisine with a Polynesian twist. In-room dining is also available around the clock for your comfort and convenience. Nestled amongst the resorts lush gardens, you’ll find the Tavai Spa, offering a wonderful selection of massages, treatments and healing rituals. For recreation, there’s a fantastic range of non-motorized water sports available, including snorkelling, paddle boarding, kayaking and canoeing, whilst the on-land activities, such as tennis, mini golf, volleyball and a fitness centre are sure to keep you entertained (and dry!). The resort is set on Motu Tevairoa, situated just a short 10-minute boat ride from the airport or 15 minutes from the main village of Vaitape. Surrounded by a stunning reef, white sandy beaches lined with coconut trees, a stunning lagoon with clear, azure waters and the famous silhouette of Mount Otemanu, it almost seems as if the breath-taking natural surroundings were crafted dreamy, relaxing holidays in mind. 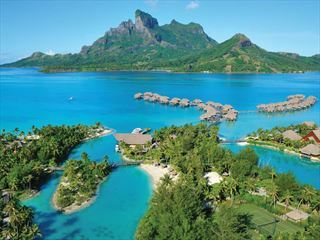 The resort is a 50 minute flight from Tahiti, followed by a 10-minute boat ride from the airport. Located closer to the shores, these 62sqm bungalows are built over the shimmering lagoon with direct access to the warm tropical waters. Accommodates up to three adults or two adults and one child (under 13 years old). Featuring unparalleled vistas of the iconic Mount Otemanu, these popular suites offer 62sqm of beautifully-appointed living space and breath-taking vistas from a private terrace with direct access to the azure lagoon below. Accommodates up to three adults, or two adults and one child. With an idyllic setting directly on the beach, these blissful 73sqm suites are styled with traditional Polynesian décor and architecture for an airy, rustic feel. Enclosed in their own private garden, you’ll be treated to incredible views of the lagoon and majestic Mount Otemanu, in addition to direct access to the silky soft beach and lagoon. Accommodates up to three adults or two adults and two children. Set closer to the end of pontoon with delightful views of the shimmering lagoon and beach, these gorgeous suites offer 62sqm of luxurious living space appointed with classic island décor. You’ll have direct access to the tropical waters below, and you’ll be within easy reach of the sublime white-sand beach. Accommodates up to three adults, or two adults and one child. Tucked away in the resorts luscious tropical gardens, this villa is the most spacious room category, offering 73sqm of sumptuous and tranquil living space. Built with traditional Polynesian décor and exotic island architecture, the villa properties are enclosed in their own private garden, canopied by luxuriant flora and swaying palms. Accommodates up to three adults, or two adults and two children. Nestled at the end of each pontoon, these lovely suites offer the ultimate in privacy and serene, wonderfully-appointed living space; they have also been recently remodelled to offer additional comforts and amenites. 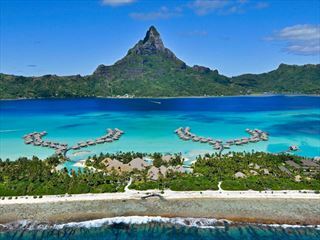 A dreamy choice for couples, these sublime suites span over a spacious, plush bedroom, en-suite bathroom and sundeck, whilst the stunning beauty of Bora Bora’s crystalline lagoon can be admired from all around. Accommodates up to three adults, or two adults and one child (under 13 years old). Set by the picturesque pool, you can enjoy a delightful choice of healthy options with beautiful views and a relaxing ambience. From delicious, freshly caught fish to succulent grilled meats, Miki Miki also serves bruschettas, tasty burgers, colourful salads, classic pizzas and pastas, in addition to the islands specialty ‘poisson cru’. In the evening, you can enjoy a fun ‘hot stone’ concept with your meal. Delight in a selection of tantalising sushi and shashimi dishes in a warm, cosy setting decorated with oriental touches and plush modern furnishings. * Reservations are required here. Set at the highest point of the resort, this ambient eatery boasts unforgettable views of the dazzling lagoon and Mount Oteamanu. Serving a delectable selection of international cuisine with creative French-Polynesian flair, the food here is incredibly flavourful and diverse. Breakfast is served in a buffet style with fantastic views of the surrounding scenery, whilst dinner is a spectacular experience under the breath-taking starlit sky. Every Monday, you can also enjoy a vibrant live Polynesian show. Enjoy breakfast in bed, a relaxing lunch, intimate dinner or late-night snack in the comfort of your own villa or suite with the option of 24-hour room service.